Following Game of Thrones's epic return on Sunday night, HBO has since treated fans to behind the scenes content from the making of the show - and a LOT of hilarious viral content. 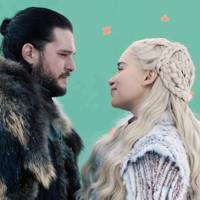 If you missed it, during the season 8 premiere, Jon Snow (Kit Harrington, if you're a total newbie) shares a passionate kiss with his lover/aunt (yep, you read right) Daenerys Targaryen, AKA Emilia Clarke. Kit is also married IRL to Rose Leslie, who was in Game of Thrones up until season 4, and Rose has a particularly close relationship with Emilia, which is where you can imagine things get a bit weird. Rose definitely watched that ep with a clenched fist, we're calling it. 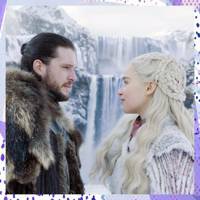 But Kit has now admitted it was "really odd" to kiss his "best friend" Emilia Clarke on screen because she’s such good friends with Rose, and there's solid evidence, with HBO releasing footage of him GAGGING on-set following a sneaky kiss with Daenerys. "Emilia and I had been best friends over a seven-year period and by the time we had to kiss it seemed really odd,” he told The Daily Mirror.